This page documents notable tornadoes and tornado outbreaks worldwide in 2003. Strong and destructive tornadoes form most frequently in the United States, Bangladesh, and Eastern India, but they can occur almost anywhere under the right conditions. Tornadoes also develop occasionally in southern Canada during the Northern Hemisphere's summer and somewhat regularly at other times of the year across Europe, Asia, and Australia. Tornadic events are often accompanied with other forms of severe weather, including strong thunderstorms, strong winds, and hail. There were 1,395 tornadoes reported in the United States in 2003, of which 1,374 were confirmed. 2003 is currently the sixth-most active year for tornadoes in the United States since reliable record-keeping began in 1950. January had no tornadoes confirmed in the United States. It was only the fifth time since 1950 that an entire calendar month went tornado-free. The other months were; October 1952, December 1963, November 1976, and January 1986. A tornado killed 17 people near the town of Yumbi in the northwestern Bandundu Province of the Democratic Republic of the Congo. Over 4,000 people were injured, 217 seriously. On the 17th, a tornado killed five people and injured 35 in Gadap Town, Pakistan. More than 80 structures were destroyed, and many livestock were killed as well. Another tornado struck the next day near Lahore in eastern Pakistan, killing two people and injuring 150. Four-hundred homes were destroyed in four villages. A rare winter storm caused 12 tornadoes. At 3:13 PM, an F1 tornado touched down in the rugged rural hills of extreme western Breathitt County, Kentucky, near Athol. Two people were killed as five trailers were destroyed, and many damaged. There were 93 tornadoes reported in March. The March 17–20, 2003 tornado outbreak produced 28 tornadoes from Texas to Georgia. During a three-day period from the 17th to the 19th, a series of 22 F1 and F0 tornadoes touched down across a widespread area, mostly in Oklahoma, Louisiana, Alabama, and Tennessee. On the 17th, an F1 tornado near Cookeville, Tennessee killed one person when a trailer was thrown 100 yards. The tornado damaged houses, barns, trailers, garages, sheds, and at least one church. Many trees were downed as well. Another F1 tornado on the 19th damaged three mobile homes, 11 homes and four businesses from the Rosalie to Flat Rock communities in Alabama. The final day of the outbreak was the most devastating. On the evening of the 20th, a supercell thunderstorm developed in the Florida Panhandle, producing an F2 tornado that struck Cypress. Two mobile homes and a single-family home were destroyed. 15 single-family and mobile homes were damaged. Numerous trees and power lines were downed. One person was seriously injured and two sustained minor injuries in the Cypress area. The supercell continued into Georgia and produced an F3. The tornado tore through Mitchell County, impacting subdivisions on the south side of Camilla. Unbelievably, another F3 tornado followed nearly this same track back in February 2000. Some residents in Camilla rebuilt homes destroyed by the tornado three years ago, only to find their new homes damaged or destroyed by this tornado. The tornado destroyed a total 66 homes, and damaged 200 homes and businesses, with the hardest hit area being the Goodson Road area of Camilla. Four people were killed and over 200 were injured. After the Camilla tornado dissipated, the supercell produced an F2 near Bridgeboro. It damaged a few dozen homes and destroyed several others. Two persons were killed when their mobile home was destroyed. Both Mitchell and Worth Counties declared a state of emergency as a result of the tornadoes. Numerous trees and power lines were downed as well. Overall, the outbreak killed 7 people. On 27 March, a series of six tornadoes struck the south Florida area. including an F2 that struck the Liberty City neighborhood of Miami and caused one death and 14 injuries. The fatality was the first tornado-related death in Miami-Dade County since 1925. As a result of that tornado, the Federal Emergency Management Agency (FEMA) dispersed over $8.4 million in funds. Additionally, an F1 tornado struck North Miami Beach and caused damage to trees and roofs, but no injuries were reported. There were 284 tornadoes reported in April. A total of 14 tornadoes touched down on April 6, 2003, in the area including northeast and east Texas, and north central Louisiana. The tornado outbreak began at 12:30 PM CDT near Ponta, TX in east Cherokee County, and ended at 4:25 PM CDT with a tornado at Clay, LA in Jackson Parish.An touched down just east of Ponta in east central Cherokee county at 12:30 pm CDT. It moved northeast crossing the Rusk county line in the vicinity of New Salem. This tornado continued on the ground across Rusk county, primarily in wooded rural areas, crossing U.S. highway 259 approximately 5 miles south of Henderson. The track then turns back towards the northwest near the community of Liberty before lifting approximately 7 miles northeast of Henderson. The tornado was rated as an F3 with winds of 158 to 206 MPH. The total track was 38 miles long and a quarter of a mile wide. The second tornado struck just west and northwest of Tatum, TX in Rusk County. It caused 6 injuries, but no fatalities. The track was about 5 miles long and 220 yards wide. The tornado was rated as F2 with winds of 113 to 157 MPH. The third tornado of the day began just southwest of Pollok, TX in Angelina County, and ended about 5 miles southeast of Nacogdoches, TX in Nacogdoches County. The track was 28 miles long and a 1/4 mile in width. This tornado was rated an F2 with winds of 113 to 157 MPH. Another weaker tornado struck part of southwest Nacogdoches, TX, about the same time as the "third tornado" was moving across Nacogdoches county. This fourth tornado had a track of 1/8 of a mile long and was 25 yards wide. This tornado was rated as an F0 with winds between 40 and 72 MPH. The fifth tornado of the day hit from just west of Clay, LA to 4 miles east of Clay in Jackson Parish. The track was 5.5 miles long and about 50 yards wide. This tornado was rated as an F0 with winds of 40 to 72 MPH. damage from the tornado outbreak cost 9.451 million. Severe storms across western Oklahoma spawned seven possible tornadoes, damaging businesses and homes in Beckham, Jackson, Roger Mills, and Washita counties. The Sweetwater (Beckham) school and its Superintendent’s residence suffered damage from one of the twisters. A tornado, rated F2 on the Fujita Scale, tracked 20 miles through Osage, Washington, and Nowata counties before moving into Kansas. The town of Dewey (Washington) was the hardest struck, with damage to 40 homes, 2 businesses destroyed, and with estimates of over $1.5 million in damage. There were 602 tornadoes reported in May, of which 552 were confirmed. This broke the all-time monthly record of 399 confirmed tornadoes set in June 1992, and would hold this record until it was broken in April 2011, when 772 tornadoes were confirmed for the month. The May 2003 Tornado outbreak sequence in the United States was a series of tornado outbreaks that occurred from May 3 to May 11. Tornadoes began occurring over the affected area on April 30, but the most prolific continuous period was the seven-day period of May 4–10. There were 401 tornado reports in 19 states and one Canadian province, 1,587 reports of large hail, and 740 reports of wind damage. More severe weather broke out this week alone than any other week in U.S. history, though comparable events occurred in May 1896, 1917, 1930, and 1949 before the modern era of tornado detection. There was a severe weather outbreak every day during the week. There were 48 people killed by the tornadoes, and damages totaled nearly $1 billion. Also six F4s touched down. The main meteorological factor for this series of tornado outbreaks was the presence of a persistent 500 mb trough over the western United States, coupled with a series of shortwave disturbances which propagated through the central and eastern United States. These shortwaves provided a mechanism for the deepening of surface low pressure areas, which followed the upper level flow from southwest to northeast. The cyclones induced a strong south to southeasterly flow in the low levels of the atmosphere (1000 mb, 850 mb) off the Gulf of Mexico. This persistent flow provided an abundance of warm, moist maritime tropical air in the central and eastern US. At least 20 people were killed by a tornado in several remote villages in the Brahmanbaria District of Bangladesh. An F2 tornado struck Bendigo, Victoria, Australia, damaging more than 50 houses on a 7 km path. Hail between the size of softballs and volleyballs fell in Aurora, NE on this day along with another storm to the East that produced a tornado. 1 person died from a tornado and another died the next night due to a tornado. One of the largest hailstones ever measured fell, 17.8 cm (7.0 in) in diameter with a 47.6 cm (18.75 in) circumference. Around 5:00 pm a large F4 tornado touched down near Huron, South Dakota ripping through the rural farmland before completely annihilating the town of Manchester. The town of Manchester since then has become a ghost town. On July 21, a significant tornado and derecho event affected the northeastern United States. The event began with four weak F0 tornadoes in Indiana. Around 3:20 pm, an F1 tornado touched down in Pennsylvania and struck Kinzua Bridge State Park, destroying the 103-year-old Kinzua Bridge. Many trees were downed throughout the park. At about 7:30 pm, a long tracked supercell thunderstorm spawned a series of tornadoes along a path of 61 miles through New York and Vermont. It produced an F2 that had multiple vortices at one point, and at its strongest near Kinderhook Lake, New York produced considerable damage. A barn was completely destroyed and its contents thrown into Kinderhook Lake. A car was flipped, one person was injured, and trees were snapped as well. Another F2 tornado near Catskill, New York destroyed several homes and injured 7 people. One woman was injured in a mobile home as it was lifted into the air then smashed into the ground. Additional weak tornadoes and wind damage occurred in Vermont. The most powerful tornado of the day was an F3 that struck near the town of Ellisburg, Pennsylvania, where a farm was completely leveled. Another home was extensively damaged, and a car was thrown 600 yards. A tractor was lofted into a stand of trees as well. Widespread derecho damage occurred as well throughout the region. The derecho itself produced a very intense mesoscale convective vortex, and at times, the entire squall line was wrapped into it, creating a "Super-Derecho", also known as a Landphoon. Overall, the outbreak produced 22 tornadoes. There were 42 tornadoes reported in August, of which 44 were confirmed. An F1 tornado hit Ewing and Lawrence townships, in Mercer County, New Jersey. There were no fatalities, but there was widespread damage to homes. The tornado touched down in Ewing near Prospect Street, crossed Olden Avenue, and entered Lawrence Township near the Shabukunk Creek. In Lawrenceville, the tornado followed a path parallel to and slightly northwest of Princeton Pike. Olden Avenue in Ewing was closed for several days while debris and downed power poles were removed. Several retail stores at the Mercer Mall and the Nassau Park retail center were also damaged. On November 17, the Storm Prediction Center forecast a moderate risk of severe thunderstorms for much of the Deep South from the Ohio Valley to the Gulf Coast as an upper level low ran into very unstable air. During the evening hours, numerous tornadoes broke out across portions of Southeast Texas and Central Louisiana, resulting in 56 injuries. Most of these tornadoes were weak, but five of them reached F2 intensity. Damage from this tornado outbreak totaled $9.934 million. .
During the late evening hours of November 26 (the night before Thanksgiving), severe weather broke out across portions of West-Central Louisiana. The worst storm spawned an F2 tornado, which formed in Beauregard Parish and traveled northeast into Vernon Parish. F3 tornado or an F2 cause destruction in the small town of Atalaya, in the province of Corrientes, in eastern Argentina. dozens of homes and cars destroyed and animals flew through the action of the tornado, had a path of 1 km. long and caused 5 killed and 50 wounded. A minor tornado hit near Inverleigh, Victoria, Australia, causing severe damage to a farm. In the south of the city of Cordoba, the second largest city in Argentina an F3 tornado that devastated a neighborhood in just minutes was formed. 400 houses, dozens of cars and 1000 trees were damaged or destroyed in this tornado (which lasted for 25 minutes and swept three neighborhoods, making it the longest lived tornado in the Southern Hemisphere). It was filmed by television cameras and by many people on the ground. The tornado caused 5 killed and 90 wounded. ^ "U.S. 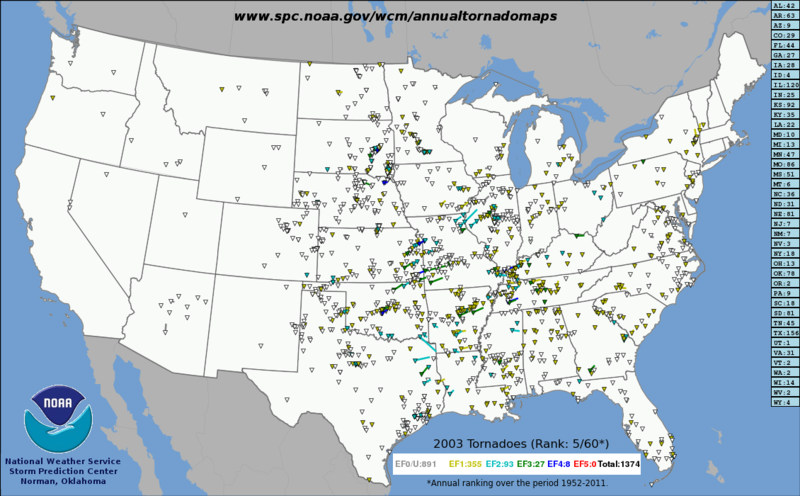 Annual Tornado Maps (1952–2011): 2003 Tornadoes". Storm Prediction Center. National Oceanic and Atmospheric Administration. Retrieved May 14, 2015. ^ "Monthly and Annual U.S. Tornado Summaries". Storm Prediction Center. National Oceanic and Atmospheric Administration. October 1, 2016. Retrieved October 8, 2016. ^ "Annual Tornado Maps". Storm Prediction Center. National Oceanic and Atmospheric Administration. 2013. Retrieved June 13, 2013. ^ a b "February 2008: A swirl of tornadoes; March a lion?". Weather.com. Archived from the original on October 18, 2012. Retrieved 2013-01-24. ^ United Nations Office for the Coordination of Humanitarian Affairs (2003-02-10). "DRC: Experts revise figures on Yumbi tornado – only 17 dead". IRIN news. Retrieved 2009-01-14. ^ United Nations Office for the Coordination of Humanitarian Affairs (2003-02-18). "Pakistan: Death and devastation following severe winter weather". IRIN news. Retrieved 2009-01-14. ^ a b United Nations Office for the Coordination of Humanitarian Affairs (2003-02-19). "Pakistan: Destructive winter weather continues". IRIN news. Retrieved 2009-01-14. ^ a b "Storm Events Database". ncdc.noaa.gov. NCDC. Retrieved 9 January 2014. ^ "Storm Events Database". ncdc.noaa.gov. NCDC. Retrieved 9 January 2014. ^ Tornado hits Bangladesh Accessed 2009-01-25. ^ a b Severe Thunderstorms and Tornadoes in Victoria Archived 2007-07-13 at the Wayback Machine Retrieved 06 April 2007. This page was last edited on 3 January 2019, at 08:10 (UTC).